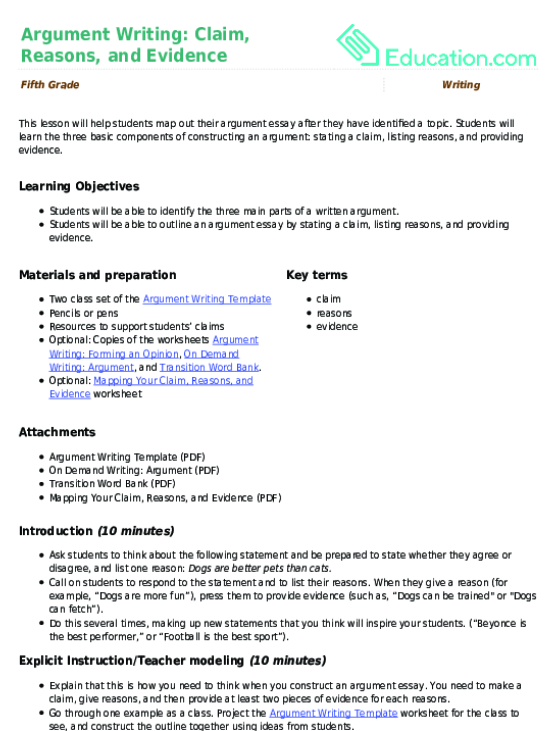 Students will be able to sketch an opinion essay outline and compare notes with a partner. Review a mentor text, preferably a 32-page picture book, that that can be referred throughout the writing process with your class. A picture walk is a great review technique where you flip through the pages of a book while commenting on major points. Share your Teacher Model Opinion Essay Sketch in a conversational tone by reading it from a hidden location. Place the model somewhere you can read it, but isn’t obvious to your students. Ask your students to talk and turn with a partner and explain what they noticed about your recital. Explain your speech was a quick sketch, or outline, in opinion essay format. 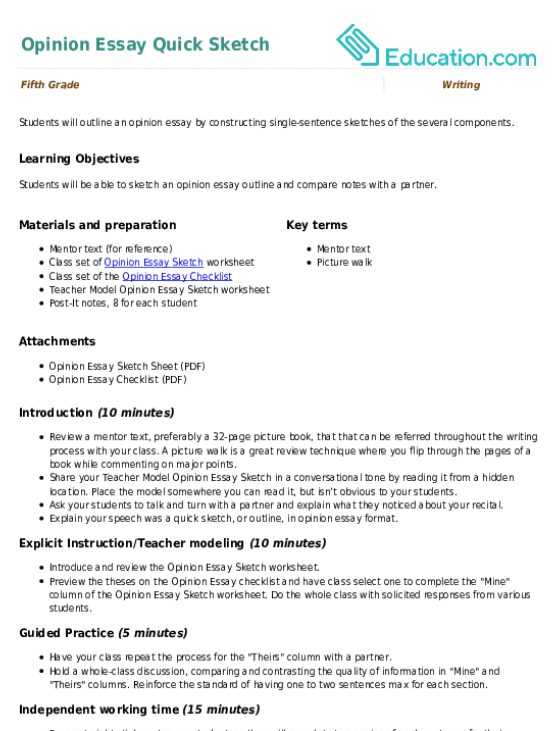 Introduce and review the Opinion Essay Sketch worksheet. Preview the theses on the Opinion Essay checklist and have class select one to complete the "Mine" column of the Opinion Essay Sketch worksheet. Do the whole class with solicited responses from various students. Have your class repeat the process for the "Theirs" column with a partner. Hold a whole-class discussion, comparing and contrasting the quality of information in "Mine" and "Theirs" columns. Reinforce the standard of having one to two sentences max for each section. Pass out eight sticky notes per student, as they will complete two copies of each sentence for their Opinion Essay Sketch worksheet. One will be for a partner’s sheet. Have students independently complete their sentence copies on sticky notes for their sketch sheets. As they finish, partner students up and have them exchange sentences. Students may work in groups on one thesis, brainstorming answers as a team. Early finishers may do "speed round" discussions using the Opinion Essay Checklist for extra credit. Students can select another thesis from the Opinion Essay Checklist for an added essay option. During independent student work times, check in with students with probing questions and encouraging comments. As you circulate, note challenges and strengths. Student roster sheets with added columns are helpful for notes to address later. Have students share partner work. Have students fill out exit tickets of one to two sentences explaining what worked well and what could be improved in today’s activity. Use this survey to help students think about their opinions and reasoning for eight high-interest prompts.